Last August we reported on ASID’s new offices achieving platinum certification for meeting LEED and WELL standards. As the criteria for both are quite stringent this is a notable achievement. Supporting their mission as an advocate for the best in interior design the planning and execution of the space were all part of “walking the walk and talking the talk.” Now that they have been living in the space we wanted to follow up and find out more about how their new offices are achieving their goal of a healthy and engaging workplace. We followed up with an additional article outlining how the project was conceived, from the CRE perspective with a story by Wendy Feldman Block. Although there was considerable coverage of this project when it opened, we wanted to formalize our information as a project profile highlighting how the new office has provided the ASID staff with an improved work experience after their initial occupancy. The ASID HQ is the world’s first LEED Platinum and WELL Platinum certified space. As a living laboratory for the “Workplace of the Future,” the office is a model for innovative workplace design where collaboration, flexibility, sustainability, and occupant well-being are the primary design drivers. Read more details in the press release. What is the SF or the project? The space was renovated to meet ASID’s design program. How many employees does ASID have, and what is the average daily population? There are 30 employees, and we average about 20 people daily occupancy. Is there a mobile work, or work from home policy? YES, all employees have the flexibility to telework when needed; 7 percent work from remote locations. What kind of workspaces are provided? There is free address, open plan workspace with enclosed offices available for reservation, and wired communal spaces (café, communal table). There is a multi-purpose room (transforms into boardroom, classroom, lecture layout), huddle rooms, and meeting rooms. What another kind of support space or amenity spaces are provided? There is a work support area, wellness room, webinar recording studio, and café in the office space. The office also houses a Material ConneXion library displaying a collection of 300 curated healthy innovative materials for visitors to touch and feel. What are the projects location and proximity to public transportation and other amenities? The office is in downtown D.C., within a 0.5-mile radius of 4 metro lines and multiple bus stops. Many amenities are within walking distance (excellent walkability score). There is bike storage available in the building’s parking garage and a fitness center with gym classes and shower facilities on the first floor of the building. From the initial planning, ASID was committed to making sure their new workspace would showcase how design can have a positive impact on the health and well-being of employees as well as providing a space that was functional and aesthetically pleasing and forward thinking. The ASID headquarters is the first space in the world to achieve both Platinum Level Certification for the WELL Building Standard™ (WELL™) under WELL v1 and Leadership in Energy and Environmental Design (LEED), under the LEED ID+C rating system – the highest recognition awarded by the U.S. Green Building Council (USGBC) and the International WELL Building Institute™ (IWBI™). The office space, designed by Perkins+Will, incorporates the most innovative health and wellness design features and has sustainability as a central philosophy. The ASID Research team partnered with Cornell University, Delos, and the Innovative Workplace Institute to conduct a comprehensive pre- and post-occupancy study of the ASID HQ examining how workplace design impacts health, wellness, employee satisfaction, and work performance. The investigation began in 2015 and included four independent research projects (one from each respective partner) to accomplish the study’s overall research goals: 1) investigate the impact of innovative workplace design on work behavior and performance; 2) examine how spatial design supports organizational goals and work requirements; and 3) demonstrate the effect of design on human sustainability, organizational sustainability, and environmental sustainability. ASID has documented the impact of the design in their report issued post-occupancy. ASID has posted a case brief prepared by Perkins + Will on the design process. Highlights include a detailed summary of the collaborative methods utilized to gather all information needed to formulate a cohesive project plan that considered all stakeholders concerns. The process emphasizes the success of the project was informed by the inclusive nature of the design team to interact not only with the ASID management and employees but the early involvement of other consultants from the real estate brokerage and other outside experts. Multiple design charrettes were conducted and continual monitoring of meeting the LEED, and WELL certification goal during the construction phase kept everyone on target and informed of how they were working to achieve the broader project goals. ASID conducted multiple surveys as part of the programming and design process, and to establish a baseline for comparison of post-occupancy information. The pre-occupancy research was critical to the success of not only the project but to the overall research goals of the organization. ASID Research conducted focus groups with each unit to gather information on work processes and workplace expectations/concerns. The feedback was compiled and shared with leadership and the design team. Multiple employee educational sessions were scheduled with topics ranging from healthy building design to the benefits of circadian lighting and ergonomic training. To prepare for moving to a “free address” open plan space, ASID practiced different seating arrangements periodically, so employees would be used to working in multiple environments that would be provided in the new office. Were there any or unusual construction materials or techniques employed in the project? Materials and furniture specified for the project were rigorously evaluated to eliminate substances that could potentially contribute to adverse health effects, where possible, in compliance with ASID’s health and sustainability goals. Products with Health Product Declarations, DECLARE or Cradle to Cradle Certification make up most of the material specifications, and all furniture on the project has one of those labels or is certified under the BIFMA Level standard. Read more about the multiple design elements utilized in the project here. ASID Core Values are displayed on glass film of the main conference room (located near office entrance); the color scheme is from ASID branding elements. All spaces are designed to support employee health and wellness/wellbeing. Individual workstations are equipped with ergonomic furnishings, including adjustable height desks, adjustable task chairs, keyboard trays, flexible monitors, and task lighting. The office has a circadian lighting program designed to mimic the daily color temperature cycle of natural daylight, utilizing both natural and artificial lighting, to maximize the health benefits of exposure to natural light for occupants. 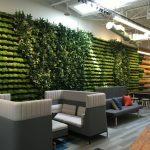 Biophilic design strategies are employed throughout the space to reduce stress and trigger elevated levels of cognitive and emotional performance in occupants. A wellness room is available for respite, including aromatherapy and yoga features. What kind of technology products were used (i.e. collaboration/ communication/ wayfinding/ space utilization)? Multiple technology solutions are employed throughout the space: Lutron lighting and shading control system with light sensors and circadian lighting, Lutron Green Glance® software for energy savings, Optix (powered by ShareDesk) for space utilization data and analytics, Alerton BAC-Talk for real-time metrics of the office (temperature, RH, CO2, Ozone). If the company relocated to new space, what was the most challenging aspect of the change for the employees? How did the ASID communicate about the changes and moves? Employees were provided constant design updates and participated in several focus groups. Yes, a comprehensive pre/post-occupancy research including various methods were completed. Research findings can be accessed here. ASID measured several data points on how the space improved the employee experience – the results are outlined in their post-occupancy research with focus on how design improved environmental quality (air quality, lighting, acoustics, and spatial quality). Other data captured how employees fared in the new office concerning collaboration and engagement, productivity and overall health. The study concluded that ASID’s ROI for the project did affect their bottom line. Financial considerations are always a key component in determining results of any business investment. Take an interactive tour of the ASID HQ office and learn more about the products and design features here. Hear more about the ASID HQ office story.